Heat reserved bacon skillet over medium. If the pan isn’t fully coated with bacon fat, add a good drizzle of oil—you want to make sure that there’s enough fat in the pan at all times so that each potato gets a piece of the action. Arrange half of potatoes in a single layer in skillet. Season with salt and cook, undisturbed, until golden brown and crisp underneath, 6–7 minutes. Flip with a metal spatula, add 2 Tbsp. oil, and continue to cook on opposite side until golden brown and edges are crisp, 5–6 minutes more. Transfer to a platter. Heat remaining potatoes and 2 Tbsp. oil in skillet over medium. Season with salt and repeat browning and flipping process, adding more oil if the pan gets dry. Three more Mondays till Thanksgiving. And I’ve already got mashed potatoes on my mind. We can banter all we want in the coming weeks about the merits of parsnip confit (check out the new recipe) and BA’s famous shaved kale and Brussels salad, but I’ve always believed that the big meal is about nailing the basics. And there is no dish more essential, more satisfying than a large bowl of buttery, creamy mashed potatoes. First up, the potatoes. At Bon Appétit, we love Yukon Golds. They not only lend an attractive golden hue to the finished product, but they deliver a richness that russet potatoes simply do not. Salt. When boiling your Yukons, be sure to add a generous amount of salt to the water. This will infuse your potatoes, all the way through, with flavor. If you don’t adequately salt your water, you’ll be futilely reaching for the shaker at the table. Moisture—boo! After you drain your perfectly tender potatoes, return them to the still-hot pot. Shake them around to allow any excess moisture to steam off. You can even turn the stove on low to aid this process. Ultimately, you want creamy mashed potatoes, not watery ones. Flavorings. Yeah, no. This magazine and others, over the years, has called for everything from roasted garlic to horseradish. We’ve asked you to infuse your milk or cream with fresh herbs. Which is fine, if you really want to. But perfect mashed potatoes don’t need anything more than butter, salt, and cream. 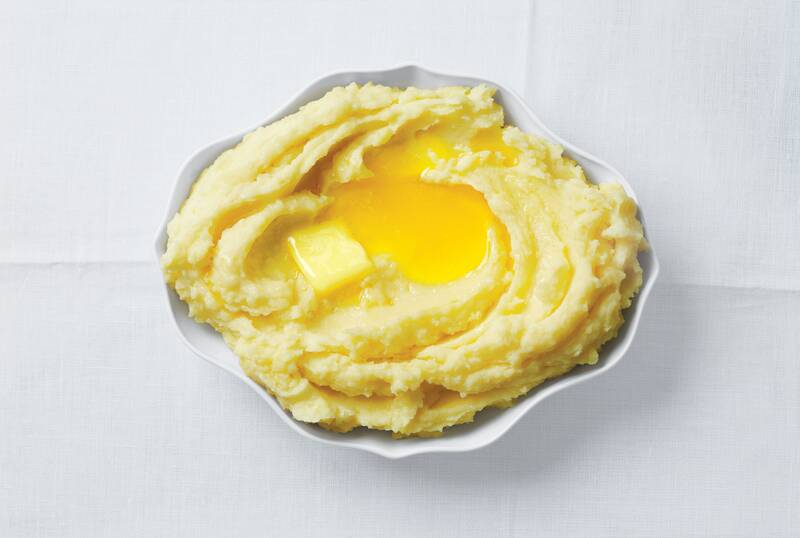 (Emphasis on the butter in our extra-buttery mashed potatoes recipe.) There will be so many flavors and competing dishes on the Thanksgiving table, your mashed potatoes should serve as the bedrock for the entire menu. So keep them basic, in the best possible way. Tools. Do you own a ricer or a food mill? You should. Both are old school and both get the job done. The former is like a giant garlic press, the latter like a hand-cranked food processor. (A food mill is pictured below!) Each produces miraculously fluffy and smooth mashed potatoes. Not a lump to be found. Moisture—yay! Chances are, if you’re the organized type, you mashed your potatoes ahead of time. Smart move. But when you gently reheat them just before sitting down at the table, you’re going to need to add some liquid to rehydrate them (they will have tightened up as they sat). So, either stir in some warmed milk and cream, or try adding some reserved potato water from the pot, all nice and salty and starchy. It does the trick. Watch how it’s done. If you’re the type who’s a visual thinker, or you’ve just got five minutes to kill, or you just really like mashed potatoes, watch the always-charming Andy Baraghani make flawless, ultra-creamy mashed potatoes in the BA Test Kitchen. Then get in yours and do it yourself.